We have created an interesting collection of Low Cal Chutneys to go with your snacks and meals. Indian's love to spice up their dishes chutney like Dosa, Idli, Pancakes, Vada Pav, Samosa and on and on. But since you are on this low calorie category, it is important that you make use of these low calorie chutneys for healthy snack recipes like Moong Dal Dhokla, Oats Idli, Oats and Cabbage Roti etc. By replacing the unhealthy chutneys with these healthy one’s you will make drastic reduction in your calories because all the hidden calories come from heavy chutneys and accompaniments. Kick out the not so healthy ingredients from your chutney recipe list. 6 Ingredients used in low quantity for Low Cal Chutney. These ingredients can also be eliminated from the chutneys. The Mint and Onion Chutney gives only 20 calories per serving and can be used on Buckwheat Pancakes or a Moong Sprouts Tikki. There is zero fat added to this chutney and its Diabetic friendly. Then there is the Green Chutney recipe made up of coriander, green chillies and roasted chana dal which will definitely become your all-time favourite for snacks and as well as for main meals. This Tomato Chutney is made with only 1 tsp of oil and works great with bland dishes like Idli and Appes. Then there is Fresh Garlic Chutney which is quick and easy to make and goes well with oil free Vada Pav. The fresh smell of garlic is just mesmerizing and this chutney is also heart friendly. Try this Lebanese style chutney called Shatta which is a spicy red chutney suitable to be used as an accompaniment for healthy tikkis and falafel. 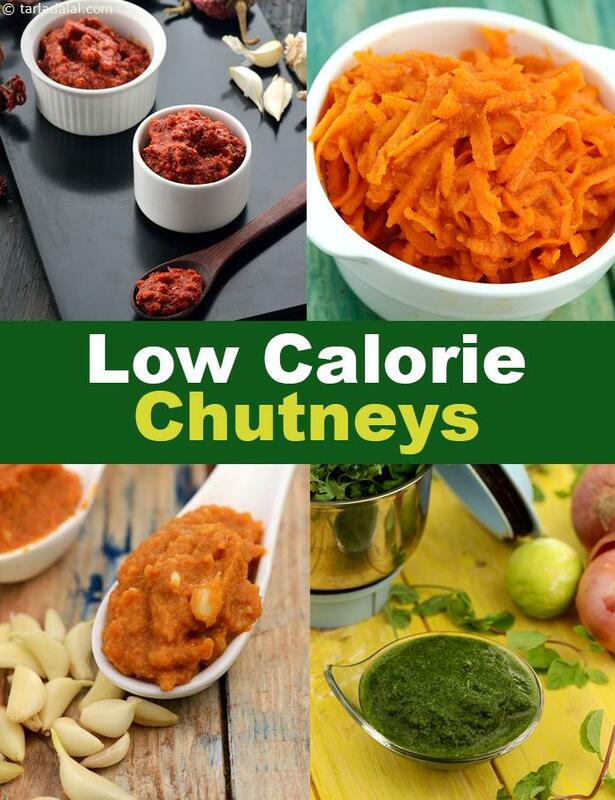 Enjoy from our range of low calorie chutney recipes along with low calories recipe articles below.